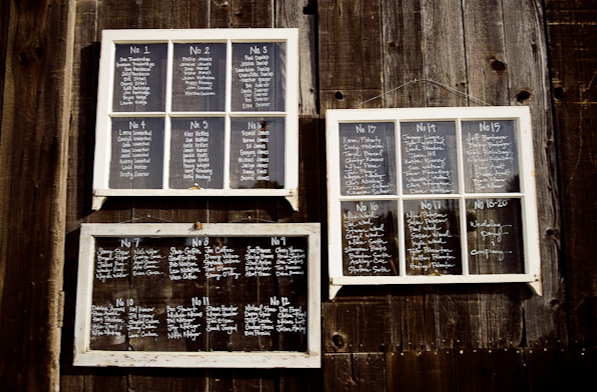 It brought me great joy today to see that the little old windows that my mom and I hunted down at a salvage store and used for our seating charts were put to good use. We donated them to the Dana Powers Barn after our wedding for future brides to use and wouldn't you know, they made their little way on to Style Me Pretty today. well done kids. I love them. They are so fun... and could easily be used again. Love, love, love. Also super love you left them for others to use. These look lovely. What kind of a pen did you use to write on them? I tried writing on windows with car window markers the other day, and it came out much too thick. What an amazing and fun idea! And so nice of you to donate for other brides to use. Spreading the love! That's awesome! It didn't even register that these were yours when I saw this picture earlier. They stole your moss letter idea too! So creative, I love this idea! Love it and wish I had thought of it myself. We used barnwood frames and stapled in chicken wire. Let's just say that using a staple gun two days before the wedding is NOT recommended if you are the bride or groom.